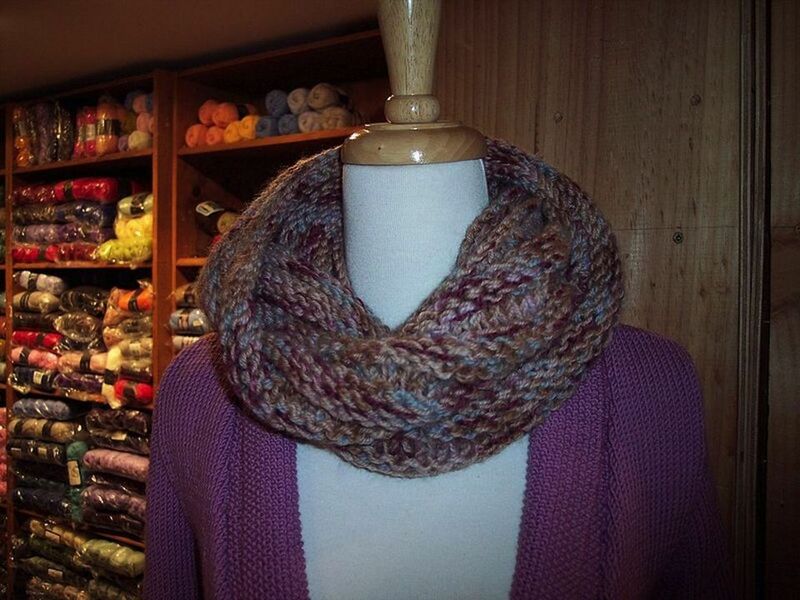 This mobius scarf or infinity scarf is a great introduction to the concept of mobius knitting. It doesn't use any difficult skills to make the inside-out shape; in fact, you might have accidentally made a mobius in this way before not knowing that it was actually a design feature! Because of this, it isn't a true mobius, but it's still a lot of fun to knit and less intimidating for newer knitters. Finished mobius is 6 inches wide and about 40 inches around. To fit most people. To begin making your infinity scarf, cast on 130 stitches. Join in the round, making sure that there's a twist in the stitches somewhere, as pictured near the end of the needle on the left-hand side of the top picture. Place a stitch marker to indicate the end of the round. Once you've cast on and joined your work in the round, it's time to work the pattern. The first row will feel pretty awkward as you push the twist around the needle, but after a couple of rounds, it will be smooth sailing. The pattern is Garter Stitch with an eyelet round, but remember, to work Garter Stitch in the round you must knit one round and purl one round. To begin, knit a round, purl a round. Repeat these two rounds. Next round, *yarn over, knit 2 together. Repeat from * around. Purl the next round, then knit a round, purl a round, knit a round, purl a round. Repeat steps 3 and 4 until piece measures about 5.25 inches or width of your choice. Purl a round, knit a round, purl a round. Bind off in knit.